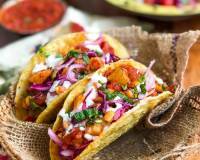 Crunchy Fish Tacos Recipe is a delicious Mexican recipe of crispy fish sitting on a soft taco that is slathered with some fresh coleslaw. Ideal for a party appetizer or even as an after school snack. Do give it a try! 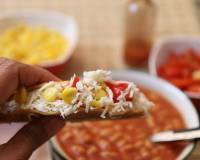 Crunchy Fish Tacos Recipe is a lip smacking dish with fish as the star ingredient. 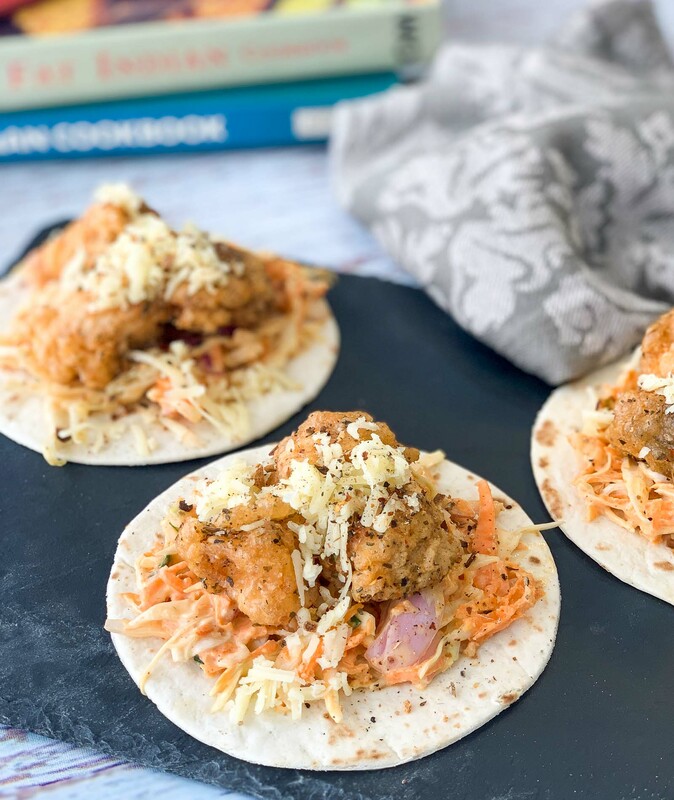 Soft all purpose flour tortillas are lightly toasted, topped with a fresh coleslaw, some crispy fish over it, and a generous sprinkle of mixed herbs. 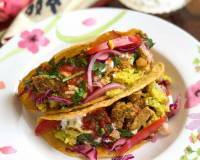 A great taco recipe, you can serve it as an appetizer for dinner parties or pair it with a wholesome soup for a complete meal to serve to your family over the weekends. While the fish tastes very good in this recipe, you could also replace it with vegetables or even chicken. 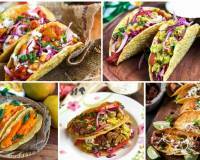 Serve Crunchy Fish Tacos Recipe as part of a Mexican meal along with Spinach And Cheese Enchiladas Recipe, and Tres Leches Recipe - Mexican Three Milk Cake for dessert. To begin making the Crunchy Fish Tacos Recipe, we will first make the crispy fish. In a mixing bowl, combine salt, black pepper, egg, all purpose flour, rice flour and corn flour. Whisk the batter until well combined. Heat oil in a kadai, dip the fish cubes in the batter and gradually drop them in the hot oil. Deep fry the fish until it turns golden brown. Once you've achieved the desired colour, using a slotted spoon, remove the crunchy fish from the kadai and transfer into a plate lined with absorbent paper. Instantly sprinkle mixed dried herbs over the crunchy fish and toss well to combine. Keep the fried crunchy fish aside. In a mixing bowl, combine the carrot, cabbage, onions, salt and pepper. Next gradually fold in the sour cream and set aside. 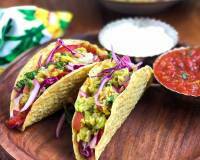 You can choose to either make Corn Tortillas by following the Homemade Corn Tortilla Recipe or make whole wheat tortillas by following Homemade Whole Wheat Flour Tortillas Recipe. Lightly toast the tortillas on a hot skillet for 30 seconds on each side. Remove from the skillet, slather the coleslaw over it, then place the crispy fish over it, sprinkle cheese and herbs and serve. Repeat the same for the other tortillas.